D-Luxe Burger is home to many delicious burgers and shakes, but if you are looking for a small and tasty snack you can grab an order of their fantastic fries! Located in the Town Center area of Disney Springs is Disney’s own burger shop where you will find juicy burgers and artisan gelato shakes. 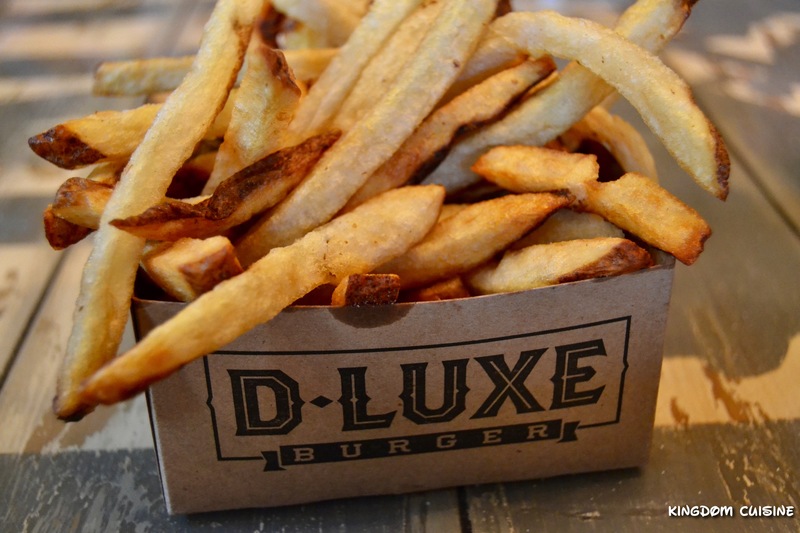 The fries from D-Luxe Burger come in either a small or large order, and are served with your choice of dipping sauce. When looking for a snack at Disney Springs, many cast members may send you in the direction of D-Luxe Burger for either a decadent shake or to taste the crispy and seasoned fries (we were suggested to taste the chipotle mayo dipping sauce!). These are not your average fries, the fresh-cut fries are crispy and well seasoned. With a crunchy outer layer and a soft center these pair perfectly with any one of the dipping sauces! Pro Tip: If you are not sure which sauce to try, ask to taste them all!